How often have you heard that from a laboratory? At 4path, we understand that there is a patient behind every name. Behind every specimen. Behind every report. Behind every call. We understand that there are times that the information we supply to your physician can be news that you were not expecting. Diagnoses that you don’t understand. Maybe even scary. Sometimes we are a patient too. It helps us understand both sides of the health care system. We work hard to help you in any manner that we are able. Perhaps it’s providing a second opinion on a case from another institution. Maybe you want a second opinion on a case that we have diagnosed. We encourage second opinions. We understand that they can help patients feel more confident with the diagnosis that they may receive and ensure selection of the proper treatment protocol. We remember…it’s about you. Our patient. We are here to help. And it all starts with the diagnosis. Even if 4path doesn’t provide the initial diagnosis for your biopsy, we CAN provide a Second Opinion on your specimen. It’s easy and the right thing to do. A second opinion can provide you with the peace of mind knowing that you specimen has been reviewed by several (not just one) pathologist. When we agree (which is the vast majority of time), you can be comforted by that knowledge. If we disagree, further evaluation is indicated for resolution of difference before your treatment is initiated. We can help facilitate additional reviews, when necessary. We are honored that you picked 4path to help you with this very important step in your health care. You may not think about it, but it does matter where you have your specimen tested. Not all laboratories are created equal. Not all pathologists are the same. As the patient, you DO have a choice where your specimen is sent for examination. Your physician may have a relationship with a laboratory already, but it’s up to you to make sure that you are satisfied with their choice. If not, it’s up to you to tell them where you want your specimen sent. After all..it’s YOU in the bottle. Click on these various tabs for more information. Why should I send my specimen to the laboratory? This is a good question…and there are several important reasons to do this. When something is removed from your body you never can be 100% certain on what it is based on the visual examination alone. That is where the microscopic examination is valuable. Microscopic examination of seemingly benign tissues have found evidence of malignancy in rare cases. This can be from completely unsuspected areas of the body. When you are going to receive treatment with medications, it’s warranted to be sure that you have what you are being treated for! Insurance companies require documentation of the tissue examination in some cases for payment for the services. It is just good medical practice to have all tissues that are removed from the body examined for the presence of disease or malignancy. While some physicians and patients are tempted to discard tissue and not send it to the laboratory for examination to save money, it is false economy. Insurance companies cover the majority of the cost of examinations and the value of being treated for the proper diagnosis is of enormous value. Once that tissue is discarded and is lost in the trash, it CANNOT be biopsied again. That piece of tissue is unique and cannot be replaced. Who examines my specimen at the laboratory? You may not be familiar with what a Pathologist does. Your first contact with a Pathologist will likely be a report or diagnosis that we perform for you or perhaps a bill for those services. But Pathologists perform a wide variety of unique and very important functions that help provide you with optimal care and help guide your “personal” physician in your care and treatment. What does it take to become a Pathologist? Pathologists are first and foremost physicians. After obtaining an undergraduate college degree, an individual must attend medical school for four years and earn a Medical Doctor degree (or equivalent, in other countries). After medical school, to become a Pathologist, a Medical Doctor must complete a residency in Pathology. There are two branches of Pathology, Anatomic and Clinical. Most Pathologists are trained in both areas, which requires at least 4 years of training after medical school. Often Pathologists will continue in a sub-specialty area of Pathology after their residency called a “fellowship”. Depending on which area is selected this can require between one and three additional years. Just how long is this process? In most cases, Pathologists have between four and seven years of training after having completed medical school! Once a Physician has completed the above training, there are rigorous and comprehensive tests that are taken that cover a multitude of areas of a Pathologist’s training. For Anatomic and Clinical Pathology, the test is three full days long. Only after passing this test can a Pathologist be “Board Certified”. Some of Pathology’s subspecialties also have additional Board Certification, however not all do. 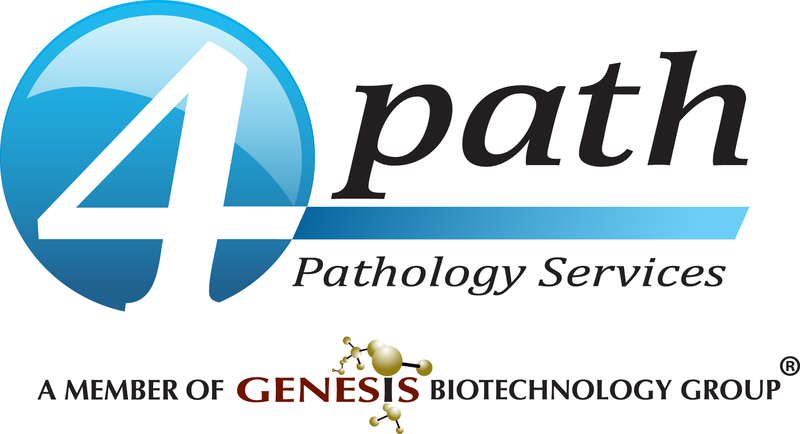 All 4path pathologists are Board-Certified in Anatomic and Clinical Pathology. In addition, many have had additional training in surgical pathology, Dermatopathology and GI (gastro-intestinal) pathology. Anatomic Pathology can be best understood when you look at the first word in the specialty … “Anatomic”. This refers to “anatomy” or the study of the body and includes the fields of Surgical Pathology and Cytopathology. The practice of Surgical Pathology looks at the tissues and cells of the body for evaluation and detection of disease. It includes examination of specimens removed or sampled (biopsied)in surgery or other locations, such as the doctor’s office or in radiology. The pathologist is responsible for the examination of the tissue and giving a diagnosis to your doctor. Cytopathology (also known as Cytology), like Surgical Pathology, is concerned with the evaluation and detection of disease in tissues. However, in Cytopathology, preparations of individual cells, rather than intact tissue, are examined. Cytologic examination is performed on just about any organ or fluid from the human body, but the most commonly recognized test is the Pap test. This is a screening test to help detect abnormalities of the cervix that would require further examination by biopsy or other techniques. It is not intended to be the “conclusive” means of examination of the cervix, but rather a “screening” technique. Cytologic examination is performed in concert with highly trained and qualified cytotechnologists, who look at the preparations and then locate abnormal cells for the pathologist to evaluate. This is an extremely important and difficult job. Sometimes there are just a few abnormal cells in the background of millions of normal cells! One special area of Surgical Pathology is the examination of bone marrow biopsies. Many blood disorders, such as anemia, leukemia and pre-leukemic conditions, are complex and require the pathologist to review slides of the circulating blood, slides of the marrow, blood and a bone marrow biopsy at the same time. This “bone marrow examination” also includes reviewing the results of red blood cell, white blood cell and platelet counts and the results of special bone marrow studies such as flow cytometry and cytogenetics. All of this means that bone marrow biopsies usually take longer to than other pathology specimens, often 2-5 days as opposed to the typical 1 day turn around time. This is so that the final diagnosis and report can give the best possible interpretation of any blood cell abnormalities present. The pathologist will send a bill to you (or your insurance) company for the examination they provide. This is called the “professional component”. In most cases, there will also be another charge from the laboratory for the preparation of the slides (called the “technical component”) for the pathologist to read. This is an involved process requiring the expert skill of histotechnologists. The processing of specimens involves many steps and typically takes between 12 and 18 hours to complete, in most cases. At 4path, with our state-of-the-art processing equipment, we can often have biopsies ready for review in as little as 3 hours! Most Pathologists are trained in both areas, which requires at least 4 years of training after medical school. Often Pathologists will continue in a sub-specialty area of Pathology after their residency called a “fellowship”. Depending on which area is selected this can require between one and three additional years. Just how long is this process? In most cases, Pathologists have between four and seven years of training after having completed medical school! Clinical Pathology is quite different from Anatomic Pathology, and is primarily concerned with the “clinical laboratory”. That laboratory is where blood, urine, and other body fluids are examined with complex machinery to evaluate the chemical and cellular makeup of the specimen. It also includes identification of infectious agents in microbiology and the preparation of blood products in blood bank to provide as safe transfusions as possible. The Clinical Pathology Laboratory functions on a day-to-day basis because of highly trained and qualified Medical Technologists. The pathologists do participate in the direct performance of some of the tests, however they are responsible for the oversight of the entire clinical laboratory. This oversight includes assurance that the tests, examination and procedures are properly performed, recorded and reported by the medical technologists. The pathologists interact and educate the general medical staff (i.e. other non-pathologist doctors) regarding issues of the laboratory operation, quality and test availability. Pathologists design protocols for testing and establish parameters for performance of clinical laboratory testing. They may help doctors select the optimal test for patients, as well as appropriate follow up testing. Pathologists supervise the professional activities of the Medical Technologists and assist in the evaluation and final disposition of abnormal results. Pathologists also help select new tests to be performed in the laboratory and help ensure that they are properly performed by overseeing the areas of Quality Control, Quality Assurance and Quality Improvement. Finally, the pathologist assures that the laboratory is in compliance with state license and certification standards, Medicare requirements, voluntary accreditation standards and Federal certification standards. Why do I get a bill from the laboratory and/or pathologist? The “Pathology Report” is a very important document that describes the Pathologist’s findings of the examination of tissue or other materials that were submitted by your physician. This can be a skin biopsy from a dermatologist’s office, a pap test from an OB/GYN office, a colon biopsy from a colonoscopy or any number of specimens that may have been removed or biopsied during surgery. To ensure release of information is only to authorized individuals, reprints are only supplied to the patient and only to the address on their government supplied photo identification. We do not send reports reprints to 3rd parties. Should you wish a report for a physician, you may request one for yourself, photocopy it and submit it to the physician directly. This includes what specimens were sent, as listed by the surgeon or submitting facility. It also includes what the doctor thought was the diagnosis before the procedure was started (the “pre-operative diagnosis”) and what they thought was the diagnosis after the procedure (the “post-operative diagnosis”). The submitting physician (not the pathologist or laboratory) provides these. This section describes the findings of the microscopic examination by the Pathologist. It can include information that is very important to the submitting physician for selection of appropriate follow up of the patient. If there are additional special studies performed, they can be described here. A summarized report (also know as a “synoptic report”) may also be present in this section if the examination is of a cancer specimen with special reporting requirements. Synoptics are used in some cases as part of non-malignant cases where a large number of data items are routinely provided by the pathologist. In some routine cases a simple description that “microscopic examination was performed” may be all that is provided, especially if the microscopic appearance of the tissue does not contribute additional information to the submitting physician. In cases where there is no microscopic examination, such as some normal tissues only examined by the un-aided eye without microscopic slides, then there will be no microscopic description given. In more complex cases, additional studies may be performed on the tissue which is submitted for examination. In those cases, that material may be sent out to other laboratories. At 4path, the reports from the outside institutions are attached to the original pathology report. In some laboratories, where there is a less sophisticated anatomic pathology information system, the information may only be summarized by the signing pathologist in the final report. These resources are provided for additional information, however they are NOT part of 4path site. The individual sites are solely responsible for their content.